Obituary for Louis A. 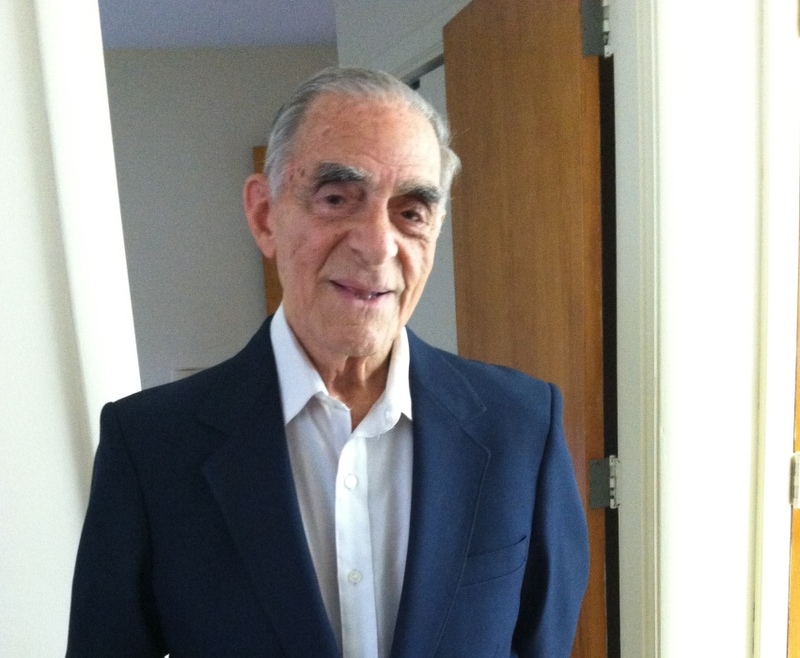 "Geno" Iannitelli | Edwards Memorial Funeral Home, Inc.
Mr. Louis A. “Geno” Iannitelli, 97, of Milford MA, died Friday (January 18th) at the UMASS-Memorial Medical Center in Worcester MA after a brief illness. He was the beloved husband of Antoinette “Netta” (Volpe) Iannitelli, who died in 2001. Mr. Iannitelli was born in Milford MA, the son of the late Alexander and the late Catherine (Zurlo) Iannitelli. He attended the former Sacred Heart grammar school and was a graduate of Milford High School, Class of 1939. He also attended Wittenberg College. Mr. Iannitelli was a WW II US Army Air Corps veteran serving from 1943 to 1945. He was a longtime employee of the former Draper Corporation in Hopedale MA, retiring in 1983. Mr. Iannitelli was a lifelong communicant of Sacred Heart of Jesus Church. He loved making trips to the beach with his family and making trips to the West coast and to Las Vegas NV. He also loved spending time with his friends at the Milford Senior Center. Mr. Iannitelli is survived by his 2 Daughters: Jean Marie Peloquin and her husband Ronald of Bellingham MA and Noreen Neary of Bellingham MA; 7 Grandchildren: Kelly Ann Haley of Hudson MA, Sean Gaffney of Spring Hill FL, Kelly Luce of Taunton MA, Leslie Gregory of Milton, Ontario Canada, Ray Baker III of Bellingham MA, Kimberly Poudrier of Northbridge MA and John Neary Jr. of Indiana; 17 Great Grandchildren: Alyson Haley, Matthew Haley, Emily Haley, Brian Mackewen, Zachary Luce, Jordan Kauffman, Gretchen Luce, Michael Luce, Coedy Neary, Maranda Gregory, Ryan Gregory, Chase Gregory, Alex Baker, Kayleigh Poudrier, Nathan Poudrier, Kaylee Neary and Monroe Neary; 3 Great Great Grandchildren: Nicholas Mackewen, Gwen Machewen and Rylee Neary; 1 Sister: Rita Harlow of Milford MA; many nieces & nephews and his close friend: Officer Tom Testa of the Milford Police Department. Mr. Iannitelli was the brother of the late Michael Iannitelli, the late Mary Minichiello, the late Irma Herbst and the late Diana Vandal; he was also the father-in-law of the late John L. Neary Sr.
His funeral, with Military Honors, will be held Wednesday (January 23rd) at 11am from the Edwards Memorial Funeral Home, 44 Congress Street, Milford MA followed by a Mass of Christian Burial at 12 NOON in Sacred Heart of Jesus Church (UPPER CHURCH), 7 East Main Street, Milford MA. Burial will follow in Sacred Heart Cemetery in Milford MA. Visiting hours will be Tuesday (January 22nd) from 5pm to 7pm at the Edwards Memorial Funeral Home. In lieu of flowers, memorial donations may be made to the St. Jude Children’s Research Hospital, 501 St. Jude Place, Memphis TN 38105-9959.